Kronomyth 4.2: The red, red rogue of Blue. If Blue contained nothing but “California,” “A Case of You” and thirty minutes of bongos, it would still be a great album. Of course, it contains a lot more than that, yet these two tracks are, in some ways, the fulcrum on which Blue’s brilliance rests. At the writing of Blue, Joni was on a journey to find something in the wide world—maybe peace, love, happiness, good omelettes. “California” is Joni’s epiphany in mid-Ozdyssey that there’s no place like home. 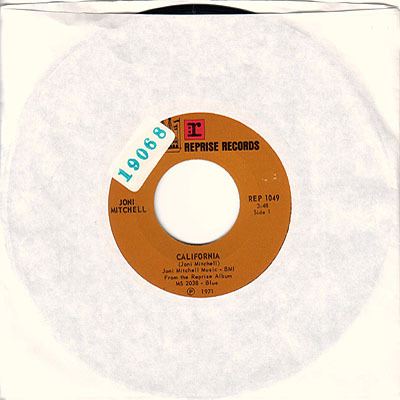 That’s the text of “California,” but there’s a subtext as well, introduced at the end of the song, where Joni asks: “Will you take me as I am?” For me, this has always been a question of forgiveness and redemption, a prodigal daughter returning to her adopted fatherland. Of course, that could just be my personal interpretation, as someone who has never been comfortable in the world and has come to accept that the only forgiveness and understanding I’ll find is from the creator who made me. “A Case of You” is another case of Joni singing the relationship blues but, instead of California, the forsaken fatherland this time is Canada. 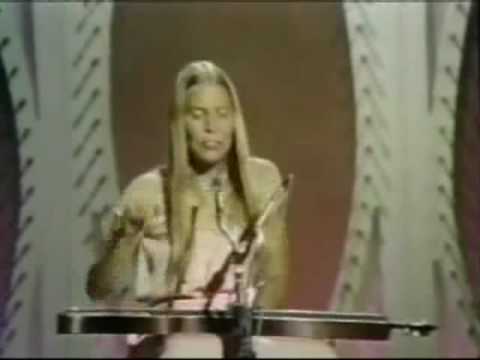 Both songs feature Joni playing the dulcimer with acoustic guitar accompaniment from James Taylor, who would go on to be the subject of several Joni Mitchell songs including “See You Sometime” from her next album, For The Roses. For my money, the ending of “California” (“Will you take me as I am?”) and the mournful cry for lost Canada on “A Case of You” (“Oh Canada”) are indelible moments in the music of Joni Mitchell over a long career. Oddly, “California” didn’t chart as a single, but it did score her a cool appearance on The Johnny Cash Show. Released on 7-inch single in October 1971 in the US (Reprise, 1049) and Canada (Reprise, REP 1049), and on April 21, 1972 in the UK (Reprise, K14130).